Recently I had the pleasure of photographing these beautiful sisters. They were cuddly and adorable. One of the special accommodations that I offer is that I go on location at no extra charge. This covers Toronto and many of the surrounding areas. Please contact me if you are unsure if I will travel to your location. 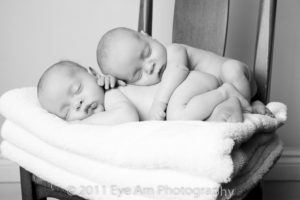 With newborns and especially twins it can be daunting to get out of the house for a newborn photography session. 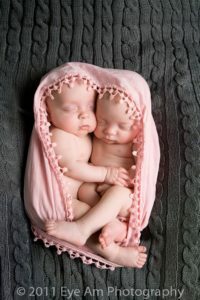 Here are some of the images from this recent twin newborn photography session. I’ll be posting more sessions soon as well as a spring sale. Eye Am Photography is now offering a select few weekday sessions. These will be shorter sessions at a reduced price. The session will be 45 minutes in length. 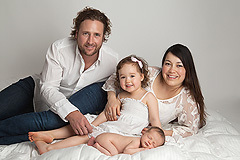 This is a perfect session for babies, children or maternity. Sessions will be held on Tuesday or Thursdays at 10am in the Richmond Hill studio. Just go into the website and click on pricing details to view complete pricing. For a limited time these mini sessions will be priced at $100. This includes the session only and does not include any prints or digital files. This album is really a work of art. It is hand crafted in Italy. The images are printed on professional photographic paper, mounted and bound into a timeless book. There are many options for the covers but the one pictured below is a metal cover. I am thrilled to be able to offer this gorgeous product to my customers. The pages are thick and sturdy. You can feel the quality of the book as soon as you hold it in your hands. One of my favourite options for this album is the parent copies. The parent copies are the exact designs of the original book printed in a smaller press printed album. You can choose 4 – 4×4 books, 2 – 6×6 books or 1 – 8×8 book for $200 for each set. These parent copies are only available with the purchase of the album. The album can be purchased on it’s own for $900 or as part of a collection. The album is priced at the same cost of purchasing 20 – 5×7 prints. The 9.5 by 9.5 inch twenty page album is truly beautiful. You will enjoy showing this album to your family and friends. Brrrr!!! It is so cold outside. I love winter for about 5 minutes and then I can’t wait for summer. It doesn’t help that I’ve been planning our summer camping vacations and camp for the kids for the last few days. I adore the look of snow but I wish it was warmer. So to keep warm I am offering a special on studio sessions booked over the next 30 days. To qualify for the special your session must be booked prior to February 10th and must take place prior to April 4th. As well this special is only for session that take place at the Richmond Hill studio. With every session booked you will receive your choice of a 10×20 collage or a set of 2 mini accordion books. The accordion books are simply adorable. They are 3×3 in size and hold 10 images. Shown below are the accordion books with custom covers. Collages are a great way to showcase your images on your walls. The 10×20 is a perfect size for 3 or 4 images. Below is one example of a design. The collage is mounted and covered with a protective uv coating. You may frame it with out without glass. Toronto newborn photographer – Happy New Year! Happy New Year! 2010 was a fabulous year for Eye Am Photography. The year started off very busy and remained busy right up until the end. Thank you to everyone who helped make it such a great year. So to start 2011 I would like to post a few pictures and then shortly I’ll be posting a winter special. Here are a few of my favourite recent images. This is a sweet little baby girl that I have had the joy of photographing from the time she was 3 months old. She is always so happy and a pleasure to photograph. 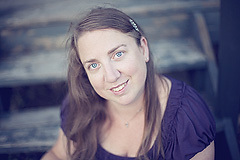 This adorable newborn from Toronto was one of my most interesting sessions of 2010. Towards the end of the year I lost my voice completely. I offered to postpone the session but his parents were so easy going that they said it was fine that I had no voice. We made do and played a lot of charades. I just adore images of children and their parents. The love and connection is just so beautiful. I always try to encourage parents to get in the pictures with their children. The time passes so quickly and it is such a special time when they are little. I have a ton more images to show and will post more soon.